Reply 'For Mr Chas. Addison'. 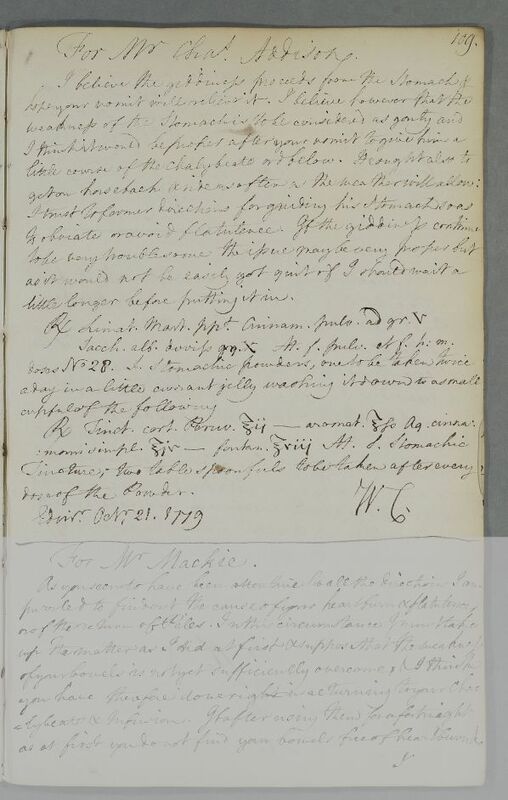 Cullen advises John Short on Charles Addison's treatment: 'I believe the giddiness proceeds from the stomach'. He includes two stomachic recipes to strengthen it. Summary Reply 'For Mr Chas. Addison'. Cullen advises John Short on Charles Addison's treatment: 'I believe the giddiness proceeds from the stomach'. He includes two stomachic recipes to strengthen it. Case of Mr Charles Addison (patient of John Short), whose various chest, bladder, and other complaints may or may not be gouty. little longer before putting it in. Take 2 ounces of Peruvian Bark Tincture, ½ an ounce of Aromatic Tincture, 4 ounces of simple Cinnamon water and 8 ounces of spring water. Mix. Label: Stomachic Tincture; two table spoonfuls to be taken after every dose of the Powder. Sacch. alb. duriss. gr. X ℳ. f. pulv. et f. h. m.